Period of creation 2016-03-29 to 2016-05-13 and 2016-07-30 to 2016-08-15 and 2016-10-23 to 26 and 2016-11-18 to 21. Commission / occasion Commissioned by the brass quintet Ensemble Schwerpunkt (Ger) for the concert series Musik 21 im NDR in Hannover (Ger), funded by Norsk kulturråd / Norsk kulturfond (The Arts Council Norway / Norwegian Cultural Fund) (Nor). 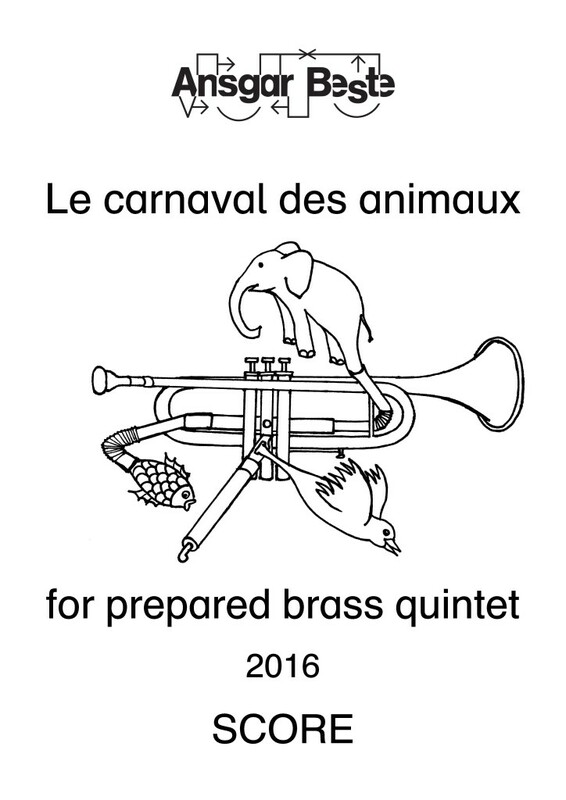 As a contemporary version of and homage to Camille Saint-Saëns’ (1835-1921) classic from 1886, the main idea of the work Le carnaval des animaux (The carnival of the animals) for prepared brass quintet (12′) (2016) consists of enriching the so-called serious music with humour by integrating various animal sounds into the compositional structure, and arousing fun in music making and listening without losing compositional seriousness. Through selected playing techniques and by means of the diverse possibilities of preparation and alienation of the brass instruments (mouthpiece, valves, inner tube, bell) a rich palette of timbres is created, which can be associated with various sounds from the animal world, not least by using a number of animal calls. But different to Saint-Saëns, the assignment of the sounds to concrete animals is left to the ear of the listener and is not divided in separate movements respectively animal portraits – the animals continuously enter into a dialogue and interact with each other. The animalistic carnival succeeds in three congenial, but timbrally differently coloured ceremonial acts (4 min. each), in each of which the atmosphere gradually develops from observant calmness to urging fervidness and overexcitedness. With each ceremonial act, the temperature rises faster and more intensely. While the spectacle ends abruptly in the first two attempts, the climax of the third ceremonial act is followed by a kind of coda: the animalistic happening gradually regains its initial balance, the carnival fades away.